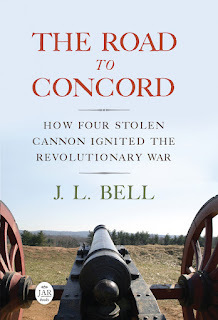 On Thursday, 5 December, Bruce Richardson will speak at the Old South Meeting House on “Five Teas that Launched a Revolution”, the first of several events leading up to this year’s reenactment of the Boston Tea Party. Bruce Richardson is Tea Master for the Boston Tea Party Ships & Museum, the other institution hosting the reenactment on 16 December. He’s also Contributing Editor for TeaTime magazine and author of several books, including A Social History of Tea. Bruce graciously answered a couple of questions for Boston 1775. What do we know about the tea that was thrown into Boston harbor in December 1773 and March 1774? All the East India Company tea aboard the ships docked in Boston Harbor on the evening of December 16, 1773, was produced in China, not India. Tea would not be cultivated in India or Sri Lanka until the nineteenth century. Benjamin Woods Labaree’s The Boston Tea Party says the three tea ships contained 240 chests of Bohea, 15 of Congou, 10 of Souchong (all black teas), 60 of Singlo, and 15 of Hyson (both green teas). It may surprise you to know that green tea accounted for about 22% of the shipments’ total volume and 30% of the value. One-third of the tea exported from China in the eighteenth century was green tea, with spring-picked Hyson being one the favorites. The first tea plucked in the spring is always the finest, which the Chinese designated yu-tsien or “before the rains” tea. Hyson [shown here, as sold through Bruce’s store, Elmwood Inn Fine Teas] was a favorite tea of both George Washington and Thomas Jefferson. Jefferson ordered it from his tea purveyor in Philadelphia and his apothecary in Williamsburg. But the bulk of the tea that westerners consumed was common black tea known as Bohea (boo-hee), a corruption of the name for the Wuyi mountains, one of the oldest tea growing regions of China. The tea was so popular that the word “Bohea” became the slang term for tea. One London publication described Bohea as infusing a dark and dull brownish red color which, on standing, deposits a black sediment. The liquor is sometimes faint, frequently smoky, but always unpleasant. The superior form of Bohea is known as Congou. Seventy percent of the tea imported by the East India Company was Congou (kung-foo). It brewed a deep transparent red liquor with a strong and pleasant bitter flavor. The addition of milk surely added to the enjoyment of this beverage. 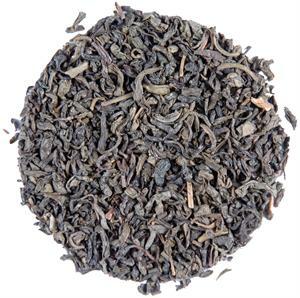 Souchong is a classic style black tea from the Wuyi Mountains of Fujian province. The original term souchong (xiaozhong) means “small leaf variety,” and refers to a family of tea cultivars that existed in this famous tea-growing region of Fujian since 1717. The souchong teas drunk by early colonists would have had a very slight smoky aroma which the tea leaves picked up during the drying process. Most of today’s souchong exports are intentionally smoked with smoldering pinewood and are called lapsang souchong. Twelve chests of Souchong weighing a total of 684 pounds were aboard the ships in Boston Harbor. Forget taxation! The colonists should have been more offended by the slight regard King George showed toward their good tastes. You can check out Bruce Richardson’s tea blog for a little more information.